Though it is uncertain who has been appropriating it, Ethiopia’s economy has been showing monumentally high economic growth for the last fifteen years. Given this economic environment, Ethiopia’s investment climate has been on the right trajectory and as a result it has been appealing to many domestic and foreign investors. However, Ethiopia’s governance has been run without accountability. It is shot-through with corruption. Conspicuous rent-seeking behavior has become a way of life in the country because people in power have been extracting wealth for non-productive activities (Desta, 2014, p. 243). As vigorously argued by Hagos, Ethiopia is one of the fastest growing economies in the world. “Yet, corruption in both the public and private sectors remains a very serious problem throughout the country” (2016). Additionally, Ethiopia’s political landscape has been triggering flashpoints that indicate signs of deteriorating political stability. For instance, massive demonstrations and violent social interactions have been flaring up throughout the country. More specifically, feeling deprived of entitlements as guaranteed in the 1994 Constitution, Ethiopians residing in the Amhara, Oromo, and the Tigrai regions of Ethiopia have been demanding and agitating for power to rule themselves so that they are able to enjoy self-identity and benefits they are entitled to. As a result of upheavals that have occurred in some parts of the country, the regime in power, the Ethiopian People’s Revolutionary Democratic Front (EPRDF), has been preoccupied with immediate or retroactive challenges. To hold on to power, the EPRDF regime has been using draconian measures to crack down on the unrest and muzzle its critics. Nonetheless, realizing that these popular demands after all need greater accountability, the regime in power has promised the Ethiopian citizens that it is in the process of designing sweeping political reforms that will soon be presented to the Federal Parliamentary Assembly of Ethiopia or the House of Peoples’ Representatives. Given the upheaval, the cardinal question that needs to be asked at this juncture is: Is the regime in power undertaking reactive or proactive measures to redress the widespread upheaval and social unrest in Ethiopia? The remaining sections of this paper are organized as follows. Section 2 outlines the tactical moves initiated by the Government to resolve the social unrest in the Walkaet and Tsegadi areas (Woredas). Section 3 presents some of the reactive management tactics used to solve massive youth unemployment in Ethiopia. Section 4, outlines some possible tactical plans that could be used to wipeout corruption and rent- seeking behaviors from the Ethiopian bureaucracy. Some proactive or basic structural changes needed for Ethiopia’s future are presented in Section 5. Section 6, considers some of the fundamental impacts the newly designed strategy might have on the political transformation and democracy-building in Ethiopia. A question was raised by an Ethiopian group of journalists on August 28, 2016, to Prime Minister Hailemariam Desalgne asking him to clarify to them whether the people of Walkaet and Tsegadi are ethnically Amharas or Tigrignas; the Prime Minister gave a clear cut answer by referring to the 1994 Ethiopian Constitution that the people of Walkaet and Tsegadi have been and are classified as part and parcel of the Tigrai Region. Therefore, given the terrible social upheavals, and sporadic acts of violent protest that have left a number of people dead, Prime Minister Haile Mariam made it clear that his government will be forced to take the necessary stepsto maintain peace and stability if the people of Walkaet and Tsegadi woredas, as they are doing now, fail to abide by the laws and rules clearly stated in the Ethiopian Federal Constitution. Additionally, concerning the dispute that has occurred between the people of Walkaet -Tsegadi and the Tigrai Regional Administrative Region, the Prime Minister stated that it is the duty of the Tigrai Administrative Region, through a referendum, to prove or disprove whether or not the residents of Walkaet and Tsegadi woredas were ethnically Amharas, before the formation of ethnic federalism and the subsequent implementation of the Tigraigna language for government and school system operations. Prime Minister Hailemariam’s interpretation of the existing constitution seems to be unambiguous. Nevertheless, even if the Prime Minister’s interpretation of the constitution is partly right, given the sensitivity of the issue (like the Silite case), in order to reduce the existing tensions that are sparking not only in the Walkeat and Tsegadi areas but also in other parts of Ethiopia; it would have been wiser for the Prime Minister to restrain his answers instead of exacerbating the case by saying that it needs to be arbitrated by the Tigrai Administrative Region. Given the unconditional answer by Prime Minister Hailemariam, the people of Walkaet and Tsegadi areas seem to have lost confidence in the Prime Minister’s judgment and have been reacting with defiance against the Tigrai administrative Region. Looking at the case objectively and considering the time it would take to resolve it, it would have been more prudent and humane, had the Prime Minister at the outset referred the case to be handled by the House of Federation (upper chamber), instead prolonging it. Given the very intense political situation in Ethiopia, Prime Minister Hailemariam was aggrieved having to address some of the heart breaking problems he has been observing throughout Ethiopia. According to the Prime Minister’s description, a large portion of the participants in the demonstrations occurring are mainly youth showing their resentment and frustration for being unemployed. Being concerned about the youth unemployment in the country, the Prime Minister resolutely assured the interviewing journalists that the EPRDF regime would be presenting to the House of People’s Representatives for approval, a radical plan that could end the youth unemployment. Even if we assume that the regime in power has the ability and the capacity to implement the tactical measures when approved by the parliament to solve the rampant youth unemployment in the country, it seems very likely that it cannot be solved without making appropriate adjustments in the real income, training, and factors of production (Desta, 2014). Furthermore, we have to bear in mind that the targets from the Growth and Transformation Plan I (GTP I from 1010-11 to 2014/15) were not met because of unforeseen natural calamities such as the El Nino disaster of last year. Given the plan that the EPRDF would be presenting to the parliament to solve the youth unemployment, it seems short-sighted, without contingencies for unexpected problems or the possibility of exploiting opportunities. Therefore, it would be more difficult to reach the target initiated by the Second Growth Transformation Plan II (GTP II, from 2015/16 to2019/20), let alone to create full productive employment for the Ethiopian youth. The existing Developmental State Model in Ethiopia does not seem to be operating adequately. It has become dysfunctional by accelerating youth unemployment. Therefore, as given in detail in my book: “From Economic Dependency and Stagnation to Democratic Developmental State…”, Ethiopia has to relinquish it reactive model and focus on a proactive strategy to look at the Employer of Last Resort (ELR) economic model. This ELR model has been widely approved by United Nations Economic and Social Council (ECOSOC) and has been used by a number of nations to achieve full employment. As described by Wary (2007) and Becker (1993), respecting the fundamental right to work, the ELR framework focuses on guaranteeing full employment by the government to those who are ready and are willing to work at a minimum wage in suitable activities. The ELR stimulates productivity, lowers unemployment, arrests inflation, and it plays a vital role in stabilizing the economy by reducing economic fluctuations. Similarly, since agriculture accounts for about 45 percent of gross domestic product and 85 percent of total employment (See Desta, 2016. P. 247); a better way of tackling and achieving full-employment in Ethiopia is by making the land-holding in rural Ethiopia cooperatively owned at the grassroots level. Currently, by and large, the government has been leasing fertile land to foreign agri-business investors to produce wheat, rice and corn for exports. As stated by Belineh (2009), agricultural products produced by foreign investors in rural Ethiopia are based on mono-cropping, which is capital intensive, and contributes to mass unemployment instead of fulfilling the promise of building infrastructure that could generate jobs for native residents. Therefore, to achieve cooperative enterprises on communal land in rural Ethiopia, it has to be operated under the “Employer of Last Resort” model. However, the ELR need not be run by government organizations.Instead, to achieve full employment, as stated in the ELR model, “the Ethiopian government must relinquish its direct control over much of the rural people. The rural community organizations need to be implemented in a decentralized way and funded by the national government,” (Kofi and Desta 2008). In the interview he gave to the group of Journalists on August 28, 2016, Prime Minister Hailemariam was very candid, stressing that the existing rampant rent-seeking behavior and the massive corruption that predominates in the country, have the tendency to devastate Ethiopia’s rekindling economy. Furthermore, Prime Minister Hailemariam insinuated that rent-seeking in Ethiopia has been generating dissatisfaction that may instill in the minds of Ethiopians an illusion that one doesn’t need to work hard and be innovative in order to accumulate wealth in Ethiopia. As stated by the Prime Minister, if we should be assured that the EPRDF Regime had a radical plan to tackle the trends in the rampant unemployment particularly affecting the youth and that it was also adamant about wiping out the glaring corruption that has taken root within the country’s governmental bureaucracy, why does the Prime Minister, under the Constitution, call for an emergency meeting of the House of People’s Representatives to deliberate the urgent case? Let us assume that the Prime Minister’s projected plan would be accepted without serious objections from the EPRDF-controlled Parliament. Considering the fact that rent-seeking is deeply ingrained, practically in all government offices, the Prime Minister’s new plan would not start with a clean slate. Instead, it is possible to assume that the strategies developed to uproot rent-seeking are likely to face formidable obstacles in the government offices. Moreover, it would be difficult to objectively assess the government’s future plan because the Prime Minister’s overarching assumptions for the plan don’t seem feasible since it has not been systematically designed. Since it is focusing on symptoms rather than on real substance, the Prime Minister’s tactical plan doesn’t appear to be based on proper advance planning. As such, it is less likely to help the country solve the existing root causes of youth unemployment. The following section suggests that policy makers in Ethiopia may need to shift from being reactive to being robustly proactive focusing on continuous improvement. Rejecting the EPRDF’s gradual and piecemeal ethno-political reform that has been in operation in Ethiopia for the last twenty-five years, now is the time for civic organizations (a myriad of people who have the desire to provide services to their community), multi-parties, the Diaspora, and other opposition groups, all to be involved in discourse and dialogues in order to pursue Ethiopia’s democratic plan for the future. A number of Ethiopian elites who live in Ethiopia or in the Diaspora are against the ethnic-based type of demarcation that has been operating since 1994 in Ethiopia to delineate the country into separate regions.These groups further claim that the regime in power is a deeply rooted administration run by tightly controlled zealots (cadres, who actively advance and safeguard their interest and the interests of the ruling party) who are not amenable to bringing fundamental changes but follow blindly the instructions given by their superiors. Though very critical about the regime in power, these groups of social thinkers argue that it is possible to bring peaceful fundamental changes and secure legitimacy in Ethiopia without endangering the fragile political stability. Based on this premise, these groups of thinkers advocate that abottom–up type of decentralized (autonomous) democratic federalismcould serve as a compromise formulato govern Ethiopia.That is, they strongly argue that establishing autonomous and self-governing regions in Ethiopia advances its economic growth and thereby moves it forward to become a middle income country in the future. In order to have a deeper understanding of the causes of the uprising in the Oromio Region, Kemente (in Amhara Region), Welkate and Tsegadi (in Tigrai region), we need to explore the establishment of the 1994 Ethiopian Constitution that created the current political background of Ethiopia. Briefly stated, the 1994 Constitution was ratified in December 1994 and implemented in 1995. On August 21, 1995, the Federal Democratic Republic of Ethiopia created a federal structure of government. By and large, ethnicity was used as an important factor to demarcate the Federal Government of Ethiopia into different regional states or kililis. Based on this, the country was divided into nine ethnic regional states. Though a number of cities, such as, Gonder, Bahre Dar, Desie, Makele, Jimma, Awasa etc. could have been included as city-states, the then existing transitional government incorporated two city-states (Addis Ababa & Dire Dawa) to be part and parcel of the Ethiopian federal polity. As previously mentioned, Article 39 of the Ethiopian Constitution stipulated that each regional state was assured the unconditional right to self-determination, including the rights to secession. As a result, the current unrest in contemporary Ethiopia seems to be inherent in the 1994 Constitution. By design or default, using Article 39 of the constitution, Ethiopia seems to have established the political gridlock for itself. Since the ethnic and regional federalism was created in Ethiopia, communication among the various constituents has gradually become inadequate because the various Nations, Nationality, and Peoples of Ethiopia were confined within watertight compartments or silos (Desta, 2014, p. 94). As planned by the Transitional Government that came to power in 1991, in theory, converting Ethiopia from a centralized system or unitary military dictatorship into a federal structure was a move in the right direction because federalism was established to allow the inhabitants of the federal states to enjoy self and shared rule. Stated differently, as a result of the formation of ethnic federalism, each region formed in Ethiopia was supposed to have the opportunity to develop, promote, and preserve its language and its culture. The majority of Ethiopians highly valued federalism because it cherished all forms of human rights. As time passed however, a number of inhabitants of the Federal Ethiopian states felt that they were denied economic and political rights by their various governments in power. As a result, they are demanding that Ethiopia needs to be restructured to accommodate the disenfranchised. 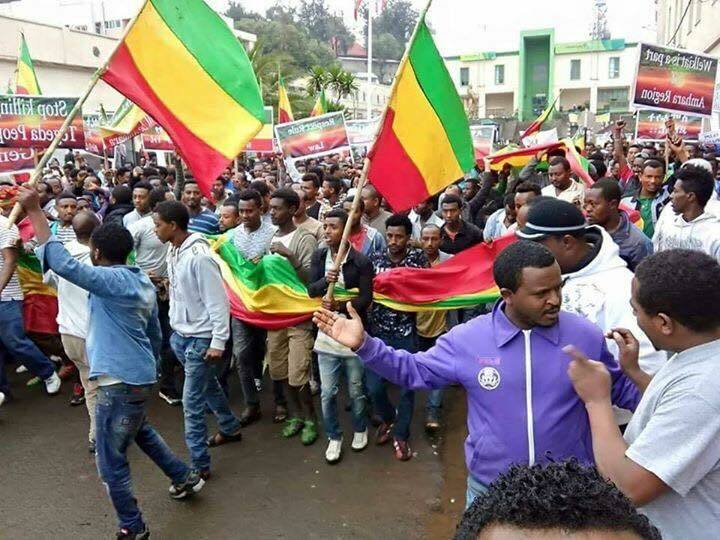 For example, it is surprising to witness that even in regions that have been inhabited by various multiethnic and cross-cultural groups, like the city of Gondar, some groups who are against the regime in power, seem to be venting their anger against Tigraians, who have no relation, except their ethnicity, to those who are in power. Since time immemorial, the now down-trodden or mishandled Tigrians have been living for years in some of the multi-cultural hubs, like the Gondar area. In mentioning Gondar, it is sad to pinpoint the ethnic unrest that exploded and left a number of Tigarianes by origin to be treated inhumanly. What is more disturbing is that a number of Tigrians who lived in Gondar were forced to evacuate their lifelong premises, leaving their belongings and made to flee to Sudan. In Ethiopia that is supposed to be governed by the rules of law and order, why is this awful crisis occurring, and how can it be resolved? If the Ethiopian policy makers are reconditioned to exercise a proactive type of management, it will not be too late for the existing federal structure to be restored. Rather than being involved in destructive activities, the regime in power and those who have a stake in Ethiopia and other civic societies need to be engaged in fruitful discussions in order to: a) democratically redress and revise the existing constitution, b) redefine the ethnically-based regional states, c) be involved in power-sharing to promote social equity, and d) reform the political system in the country. Unless the existing constitutional crisis is first resolved, no political reform is possible in Ethiopia. Using the framework of the existing constitutionas a benchmark for negotiation and discussion, a new constitution needs to be drafted by all stakeholders (i.e., representatives of all social, political, ethnic and religious groups etc.) to form a federal republic or design a federation of Ethiopian woredas. That is, based on population or other coherent historical and geographical bases that ensure proportionate representation,the current existing ethnically designed regional states need to be subdivided into manageable units or woredas. For example, ten or fifteenworedas that have common language or culture could agree among themselves to form a common regional state. But, it should be clear that each woreda has to have complete sovereignty over aspects of its political life and cannot be intruded upon by any central or federal authority. Every year, the ten or fifteen regional woredas have to circulate their administrations. This type of system could allow them to share their experiences democratically, stimulate their economy, encourage their environmental capital and have some type of social equity experiences. A governor of the woreda at the yearly meeting would be selected to be the head of the ten to fifteen woredas only for that year. Unlike the unmanageable, heterogonous regional settings that we currently have in Ethiopia, forming regional cooperative woredas could increase the residents’ capacity to empathize with one another more readily. Subsequently, each woreda could have a number of municipalities run by community elected mayors and council members.Each municipality having a strong social base, has to have control over social services (i.e., education and health services), raise its own revenues, make investment decisions, etc. As discussed by Desta (2016), the formation of autonomous self-rule woredas with local self-governance encourages local units to have a say in selecting their own administrator to bring about political stability and who can hold them to account for their decisions. For the last fifteen years, Ethiopia’s economy has been thriving. Yet, recently, in its political domain, Ethiopia has been facing slow-moving instability. Its rulers are succumbing to youth unrest. Thus as it stands now, Ethiopia represents a paradox. When a crisis is developing, what sort of governance will be resilient for running Ethiopia’s existence? Does the existing centralized federalism or the proposed decentralized autonomous federal system of administrative structure give Ethiopia the best prospect for survival? As suggested above, the proposed democratic self-rule of woredas will serve as the organizational structure for the New Federal Ethiopia and become the means of achieving effective bargaining for civic society in Ethiopia. It was with the formation of democratically decentralized geographic systems such as the proposed “ woredas” for Ethiopia, that have helped states in India, South Africa, Switzerland, Canada, etc. to attain political stability. Thus, it is hoped that the government in power and other conscientious Ethiopians are on board to see that Ethiopia is sub-divided into manageable geographic regions so that Ethiopia achieves the triple-bottom line (economic, social and environmental dimensions) of sustainability. In short, to make Ethiopia’s journey towards autonomous federalism become realty, change in visions, shift in policies and strategies, and flexible governance based on robust democracy with the capacity to adapt, improvise, change direction is needed. Becker, A. (1993). “Full Employment Without Inflation” http://www.cooperativeindividualism.org/becker-full_employment.html. Retrieved May 9, 2011. Belaineh, G. (May, 2009). “Environment and Economic Development in Ethiopia.” http: Nazret.com/blog/index.php/2009/05/27. Desta, A. (2014). From Economic Dependency and Stagnation to Democratic Developmental State.Trenton, NJ: The Red Sea Press. Desta, A. (2015). Revitalizing Ethiopia’s Manufacturing Enterprises through the Japanese Production Management Strategy.Mustang, Oklahoma. Desta, A. (June 7, 2016). “ Beyond the Usual: Re-thinking Ethiopia’s Ethnic Federation for the 21st Century.”Institute of Development & Education for Africa, Inc. Kofi., T. and Desta A (2008). The Saga of African Underdevelopment: A Viable Approach for Afric’s Sustainable Development in the 21st Century. Trenton, NJ: Africa World Press. National Planning Commission, Federal Democratic Republic of Ethiopia (2015). The Second Growth and Transformation Plan (GTP II), (2015/16-2019/20). Hagos, D.H. (March 2016). “Euphemism for Corruption in Ethiopia.” Norway, Oslo. Wary, L.R. (August 1007). “ the Employer of Last Resort Programme: Could it Work Work for Developing Countries?” Economic and Labour Market Papers.Geneva International LabourOffice , Economic and Labour Market Analysis, Department. Willums, J. (1998). The Sustainable Business Challenge: A briefing for Tomorrow’s Business Leaders.Sheffield, England: Green leaf Publishing.